Raking leaves off the grass not only cause to have a nice and clean looking lawn, it minimizes the amount of work you may have to do. Especially if you have a lot of deciduous trees, keeping the grass clean can definitely be a problem. When to rake? This is the question many lawn conscious homeowners ask. There is definitely a recommended time for raking, but it is not a hard and fast rule. So, here are a few suggestions as to the right method for raking your grass. Depending on which one you choose will determine the time. Depending on the size of your lawn will determine when you rake. You will have much more ground to cover than a lawn that is small. It will be that more difficult to manage. Getting a leaf blower to help the job along is the ideal thing. You can use the leaf blower to contain the leaves and use the rake to give that once over final clean. This may not be one of the first things to come to mind when deciding to do a raking job. 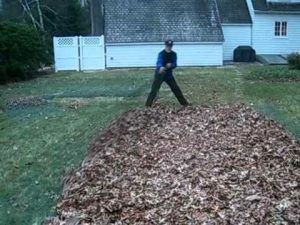 Never rake wet leaves! It is difficult, for one, and the next is, you will cause trauma to the grass, as you have to use that much elbow grease when they are wet. Dry leaves are easier to rake and remember to do this in small batches so you are able to contain them better. You do this by placing each batch in a garbage bag or wheelbarrow, especially if you are planning to start a compost heap or mulch. This may be an easier way to get rid of leaves on your grass. You will need to have a mulcher for this job. The mulcher will break down the leaves into small pieces which are spread over the lawn. They will break down over time and become instant fertilizer for your soil. 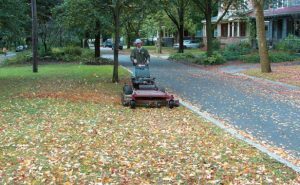 If you have a big lawn, another ideal way to cut down on leaves on your grass is to mow them. This is less work than raking. The mower will break down the leaves into smaller pieces and over time they will be incorporated into the soil. This is also workable for a small lawn. It is your choice. Raking leaves off the grass should be done at least every three days, this is the recommended time. Leaving them to accumulate will starve the grass of air, and sunlight, and it will cause diseased grass to develop, unwanted pests will decide to move in as there is a vacancy, and the weight of the leaves will prevent the grass from growing. Deciding on the right time for raking leaves off the grass is depending on how much, and what you intend to do with them. Whether you decide to mulch, make compost, or hire a lawn expert the time is always the right time for you. Raking your own grass can also be therapeutic; you get some exercise as well as feeling a sense of accomplishment when you admire the finished job.